The first post of this blog was devoted to an overview of ‘Tim Tyler’s Luck’; and synopsises and reviews of ‘Tim Tyler’s Luck’ episodes published in Turkey were promised for future posts. A total of five ‘İki İzci’ (Tim Tyler’s Luck) episodes were run in the Turkish weekly comics magazine 1001 Roman between 1940-43. 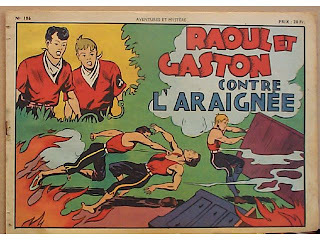 The source of the Turkish editions appear to be the French ‘Raoul et Gaston’ albums published by Moderne as part of their Collection Appel de la Jungle series starting from 1938. The below images corresponding to each episode are the covers of the post-war reprints of those albums. A villian named Spider has escaped from prison and seeks to take revenge on the Ivory Patrol. This is one of the better 'Tim Tyler’s Luck' adventures, largely due to the extraordinary persona of the villain in question: Spider has a habit of weaving webs in between trees and hanging his victims on it. Visually, he is presented to the readers often as a silhouette or in shadows. This strategy functions to depict him more as a menacing ‘presence’ and not merely as a figure. It is hard to accept that this particular episode is the fruit of the same mind who conceived the other Tim Tyler’s Luck episodes. It should also be noted that the name of the villain in the 1937 movie serial was “Spider Webb” and this strip episode is probably its follow-up. The Turkish edition of this episode appears to start with actually the finale of a seperate adventure where African natives (“savages”) attack a fortress of the colonial forces; I think that particular episode, which the Turkish readers were presented only the last fragment of, was the episode titled as Lo spirito di Tambo in the Italian editions. The ‘Mona’ episode truely kicks off with the subsequent arrival of a beautiful brunette to the fortress. The routine and undistinguished story revolves around a pack of diamonds which have been stolen by her brother and ex-suitor. Spud does not appear in this episode. 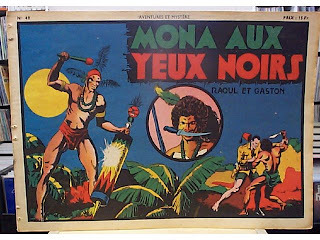 French album title: Mona aux yeux noirs (1st ed. :.1938, repr. : 1948); Italian album title unknown. 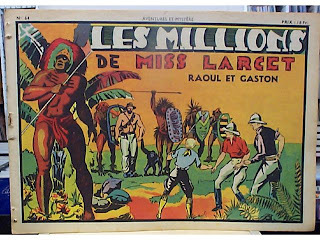 French album title Les millions de Miss Larcet (1st ed. :.1938, repr. : 1948); Italian album title unknown. This is a very simple, action-oriented episode in which a violent tribe of African natives wearing Falcon corpses as head-wear attack a watch-tower manned by Spud. The action sequences are very well-done, but the colonialist position of the episode is obvious. 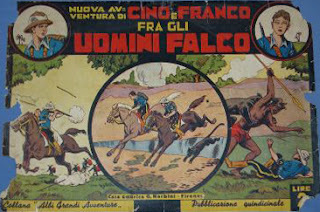 French album title unknown; Italian album title Fra gli uomini Falco (1941). The serialization of this episode in 1001 Roman corresponds (1941-42) to the peak of paper shortage in Turkey stemming from economic hardships of the war era conditions and the weekly magazine suspends publication for more than a month between issues no.135 and no.136. After this episode ends, no new ‘Tim Tyler’s Luck’ comics appears in the weekly magazine until a final one several months later. A very mediocre adventure revolving around the question of whether a stranger is a wanted fugitive or not. 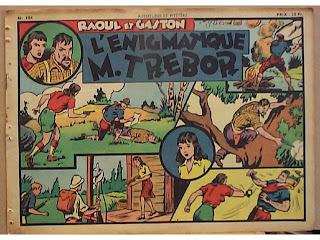 French album title L'énigmatique M. Trébor (1st ed. :.1938, repr. : 1949); Italian album title unknown. In addition to its run in the weekly magazine, 'İki İzci' was headlined in several of 1001 Roman's monthly special issues; the synopsises and reviews of those episodes will also appear in this blog in the near future.